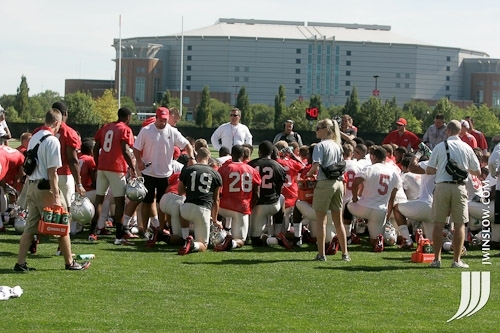 As we get closer to Kickoff Week, here’s some quick notes from Ohio State and beyond. Don’t forget to sign up for this year’s “Pick-em” contest! Injury Report- It’s no surprise to anyone who’s played or followed college football that this time of year is when people start getting dinged up. The body, no matter how well tuned, is not built for two a days and the amount of stress that those can bring- especially with the philosophy of “Make practice so hard that the games are easy”. As such, the Buckeye Walking Wounded are a significant number, but there are no serious injuries. John Simon missed today’s practice, but only as precautionary measures. Kyle Dodson, Ryan Shazier, and Michael Bennett were all limited today as well, while Zach Domicone continues to heal from his knee scope. That Being Said- Jordan Hall was running today, and said the boot comes off tomorrow. Jacoby Boren is back at practice, and is the second string center at this point. Snappy- As a former longsnapper, we loves us some Bryce Haynes here at tBBC. So, reports that his already fast delivery has improved the punt timing by around .2 of a second was yet another reason to consume a celebratory cupcake here in the office. To be fair, though… not much of an excuse was needed. Weighty Matters- Adolphus Washington has moved inside to tackle, and is having a great camp- Hankins talks about how his presence will definitely improve the pass rush this season. Star Light? The team is still trying to find who will fill the “Star” role in nickle defense- Christian Bryant may move down, although Corey Brown is also getting a look. Stripes Stripped- Walkon linebacker Joe Burger lost his today, as did QB Cardale Jones. The story of the day yesterday was the first episode of All Access, a behind the scenes look at the Buckeye program under the new regime. The problem? It was on one of the ESPN channels… and you know how we feel about those fine individuals. But… in a moment of weakness, I DVR’d it And watched it. How can you hate quotes like “Abso-smurfly”, “Bozo the freakin’ clown”, “I’m glad you’re a Buckeye, bro…”, “I like coaching you…” and other admonitions to play “hungry” and “angry”. 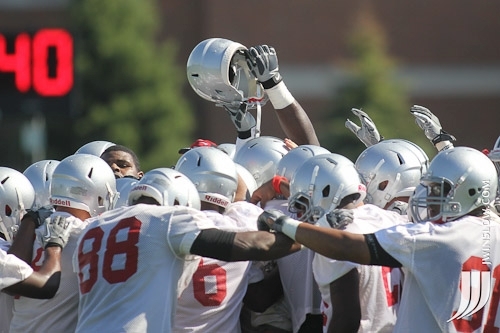 And the precision of the offensive staff’s work, the pride that Coach Mariotti puts into his time with the team, and the focus and plan that Coach Meyer is instilling into the team… it’s a really good piece. If you missed it and don’t mind the spoilers, the gang at LGHL have a really good review with picture pages and everything. I’d be really excited about this, to be honest, if all things were equal. Given the bad PR that my favorite program received over the past few years for numerous self inflicted wounds, it’s great to get excited about OSU football again- and to see a national response (including Southern Cal and Clemson recruits commenting on it) that was pretty positive. But, I’ll be honest- It’s still hard for me to not be wary about this series. You kick a dog and reach to pet him, he’ll wince and cower even if he lets you stroke his head again. Given what we know about ESPN’s agenda (Entertainment Sports Programming Network), it safe to see that they are interested in a narrative of redemption up until the point that they bang the drums marking a fall from grace. Just watch the history- 2002 upset their narrative, and then the 2003 Clarett story was a bottom. The 2006 season’s coverage was the apex of good vibes, and then this past year seems to be yet another trough in their coverage- again, a story that Ohio State wrote for itself, but one that got presented over and over and over again on the largest stage while others were way way off Broadway in Coral Gables and Columbia and Chapel Hill. So- we’ll watch (yup) and see. And, if nothing else, this will give us the chance to celebrate the splendor and power of an Ohio State team on a very particular mission. Buckle Buckeye up. Ch-ch-ch-changes: With the move to semesters, the practice schedule is a bit different than it was in the past. Today, for instance, there are two practices (veterans first, rookies this afternoon), but true “two a days” won’t start until next week to accommodate the conclusion of the summer semester’s classes. 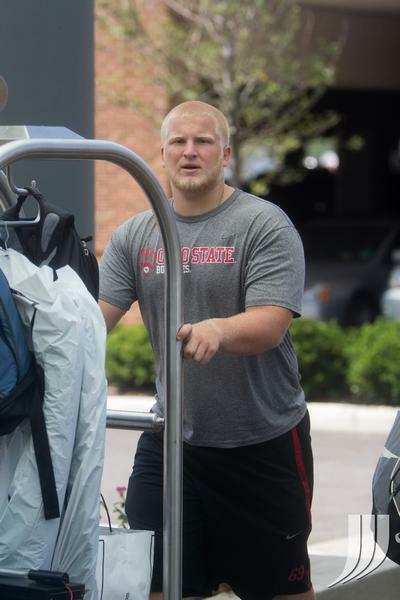 Uncovering the truth: Because of the above, most of the players moved onto campus over the past few days, depriving us of the glorious “guys carrying luggage” photos. While that’s the rationale that SID Jerry Emig is telling everyone, our research shows a deeper, more sinister reason for this change- Cameras are afraid of John Simon. Feed The Beast- Thursday night was the “Champion’s Dinner” for those who excelled during the off-season’s training, and also as a “last meal” in prep for the work ahead. As we get updates on who was honored during this, we’ll add them to this post. 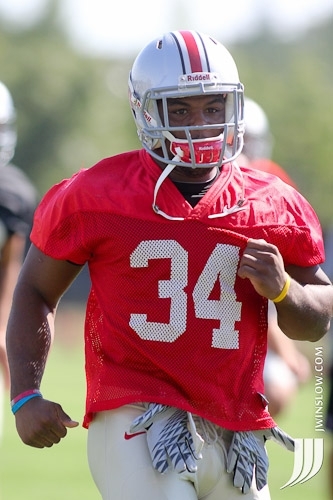 All About Timing- Some pre-camp testing 40 times are coming in: B. Roby ran a 4.39 (twice), and Carlos Hyde ran a 4.35. Buckeye dilemma: Yesterday, we were informed that the Four Letter Network has been granted access to the Buckeye training camp for a special series of telecasts on ESPNU/and the main channel (Ball State will be on The Ocho, if you’re interested). Times and dates are at the link above. We had this discussion on the ol’ twitter yesterday- does this mean that OSU and ESPN have kissed and made up? I think that it’s a mutually beneficial relationship between the two- OSU gets great PR and exposure, and starts to re-set the narrative. ESPN does what ESPN does, find a way to get viewers and sell product. I still believe that the network is less than enthusiastic about the BTN “snub”, but with the ESPN/B1G contract coming up for renewal in the near future (as well as the economics of the new playoff), perhaps they’ve decided to shift their coverage. We’ll see… unless you’re still boycotting, which I totally support. On the other hand- ESPN’s access means that local coverage will be significantly reduced this season. So, the people who know the program the best and cover it the closest have been pushed aside for the new hotness from Bristol. Yup. And finally- Ten years ago today my household went from pure scarlet and gray to including a little bit of red and white. The first words I remember hearing her say at the party where we met? “Yeah, but they don’t play defense on the west coast”. Thanks for putting up with my stupidity passion for this long, dear… you’re welcome for Coach Pelini, and get ready for October 6.